A new research project is being launched to see if harbour porpoises are returning to a river in Cornwall. The research at the River Fal will use underwater microphones to try and track the mammals, which used to be a familiar site around Falmouth. The project, which has an education aspect, is being funded by the International Fund for Animal Welfare. Local schoolchildren are getting involved to learn more about porpoises and what can be done protect them. Four pods containing detection equipment will be placed around Falmouth Bay and Falmouth Harbour to monitor the movement of the mammals. Dr Nick Tregenza, who is conducting the research, said of the pods: "Each one has an underwater microphone and computer system that recognises the sounds porpoises make and a memory where it stores all the times that it hears these sounds." He said porpoises were once the top predator in the Fal, but now they have more or less been forgotten. 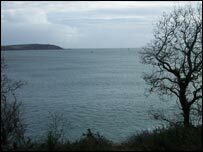 He said: "We know already that we should detect them fairly regularly around Falmouth Bay. "But after a year we'll know just how far they're still coming into the Fal and we'll have a picture of what happens at these four sites." Captain Keith Leaves of Orca Seafaris is helping place the pods in the water. He said he was excited about information which could confirm some of the things that he seen sea mammals do around the area. He said of recent sightings: "We've been most fortunate throughout the winter and coming into the spring and summer that a lot of the cetacean activity has been seen. "We've seen a lot of interaction, such as whales being with dolphins, and dolphins with porpoises." As part of the project, schools will be attending special workshops at the National Maritime Museum. It is hoped the research project will witness the possible return and recovery of porpoises to an area where they once thrived.